Radical Therapy for HIV-Infected People? Mariyanna, L., Priyadarshini, P., Hofmann-Sieber, H., Krepstakies, M., Walz, N., Grundhoff, A., Buchholz, F., Hildt, E., Hauber, J., 2012. Excision of HIV-1 proviral DNA by recombinant cell permeable tre-recombinase. PloS One 7, e31576. The Tre recombinase was created from the Cre recombinase which is a well-known tool in mouse genetics. The authors were able to alter the specificity of the enzyme by many cycles of directed protein evolution. The Cre recombinase precursor removes genomic DNA that is flanked by two loxP sites by recombination. The authors were able to alter the specificity for loxP sites to HIV-1 LTR (long terminal repeat) sites. LoxP and the HIV LTR had 50% sequence similarity. The main problem with the development of antiviral agents is the delivery to infected cells in vivo, without causing adverse side effects. There are many reported technologies for the delivery of macromolecules such as proteins, nucleic acids or peptides. The most popular currently is the use of protein transduction domains (PTD) also known as cell penetrating peptides (CPP) from different sources. These have been useful for the delivery of various genes and proteins, including site-specific recombinases. The best studied and most applied PTD’s are peptides derived from the basic domain of HIV-1 Tat. But recently a powerful cell permeable translocation motif (TLM) has been described. This TLM is derived from a hepatitis B virus surface antigen. This TLM peptide is able to enter cells very efficiently, without affecting the integrity of the cells, or interfering with intracellular signal transduction cascades. This paper describes the delivery of Tre-recombinase into cells using these PTD’s including HIV Tat and the HBV TLM. These so-called cell-permeable Tre-recombinases could eventually be useful for antiretroviral therapy, especially for virus eradication. Different protein fusions were created and expressed in E. coli ; Tre-recombinase is fused to His tag, with/without nuclear localisation signal (NLS) and with the PTD (HIV Tat) or TLM (translocation motif derived from hepatitis B) or TLM as an inverted repeat. Interestingly, all of the proteins entered cells, even those without a PTD or nuclear translocation signal. The authors explain that the Cre enzyme precursor to Tre has been shown to transduce into mammalian cells without any help, and therefore it is likely that the Tre enzyme shares this property. The authors did remark that the signal intensities were higher for those proteins with a PTD, indicating higher transduction efficiency. A transient reporter assay demonstrated the activity of the Tre fusions: The reporter construct contains the target LTR sites that flank a puromycin resistance gene. Tre enzyme activity results in the loss of this gene, and gives a smaller PCR product using primers that anneal to the vector backbone. Cells transfected with the reporter construct were incubated with the 1 µM of the various proteins for 5 hours. The positive control was co-transfected with a construct expressing the Tre enzyme. PCR was performed on DNA extracted from cells after 48 hours. The presence of the smaller PCR product indicated that recombination had happened, as in the positive control. All of the proteins had varying degrees of activity, but notably the protein with the TLM PTD had the highest activity, with no un-recombined product detected by the PCR. The authors went on to demonstrate that the Tre fusion proteins were active on at the genomic level, i.e. on chromosomal DNA. They used cells with the reporter construct was stably integrated into the genome. Co-immunoprecipitation (ChIP) assays were done on using HIV-1 -infected T-cells (CEM-SS) to demonstrate the interaction of two of the Tre fusion proteins with the HIV LTR target sequences. The results showed that the proteins interacted with target LTR sequences in the genome of infected T-cells. The authors performed a transcriptome anaylsis on cells exposed to the Tre fusion proteins, using human whole genome microarrays. They concluded that the proteins were unlikely to have a significant effect on gene expression in the host cells, as very few genes were regulated more than 2.5-fold. Up to this point, the Tre fusion proteins had been shown to be capable of excising reporter construct gene flanked by LTR sequences both at the episomal level and the chromosomal level. The authors also showed that the proteins bind to the target sequences in HIV-infected living T cells. It was essential that the Tre fusions could excise that HIV proviral genome from the chromosomal DNA of HIV-infected cells. The aouthors generated HeLa cells and T cells infected with pseudotype HIV-1. These are cells with the full-length HIV provirus integrated into the genome.They chose one of their proteins (TLM fusion showing highest activity in the reporter assays) for transduction into these cells. After transduction, PCR was performed to detect the HIV circular recombination product. They found that the recombination activity increased in a dose-dependent manner in both the HeLA cells and the T-cells. They also sequenced the PC products and were able to confirm HIV sequences. 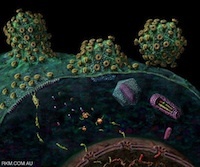 Some novel therapies for the treatment of HIV focus on the eradication of the virus in infected individuals. These include RNA-based technologies such as RNA aptamers, siRNA and ribozymes, but while these have shown to reduce viral load and viral replication, they have so far failed in virus eradication. A recent approach aimed at virus eradication is the reduction of surface CCR-5 receptors, through the expression of engineered zinc finger nucleases. This results in fewer CCR-5 surface receptors and could prevent new infection by CCR-5 tropic HIV. The other approach is the use of site specific recombinases like Tre, which can excise the provirus from the host genome, thus potentially eradicating the virus from the individual. Ideally, the gene expressing Tre could be delivered to and expressed in target cells using a viral vector. But there are safety concerns as most of these are derived from pathogenic viruses. Therefore it may be advantageous to deliver the Tre enzyme directly to host cells. One way of doing this is through protein translocation domains (PTD’s). Protein transduction domains (PTD’s) can deliver bioactive molecules, including genes, siRNA, proteins or liposomes into all types of cells in vitro and furthermore into various organs in vivo. But they have not been applied yet for human use. PTD’s are easily fused to any target protein through cloning and expression of the fusion protein. The LTM used in this paper, derived from hepatitis B virus surface antigen, has low immunogenicity and high spreading capacity. One strategy of using cell-permeable Tre enyme could be to harvest T-cells from the patient by apheresis and transduce them in vitro. They could then potentially be expanded and reinfused into the patient. This could complement or even replace gene transfer procedures. In this paper the expressed Tre fusion proteins could enter cells and act on the target sequences to excise the HIV provirus from the genome, but the Tat fusion and the TLM fusion had higher activity than those that didn’t have a PTD tag. In particular, fusion to the newly described domain (TLM) from hepatitis B was resulted highest activity. This may explained by the fact that, in contrast to HIV Tat, TLM does not rely on endocytosis to enter cells. This might preserve enzyme activity and protein half-life. In conclusion, cell permeable Tre enzyme could eventually be useful as an anti-HIV therapy in the post-HAART era.